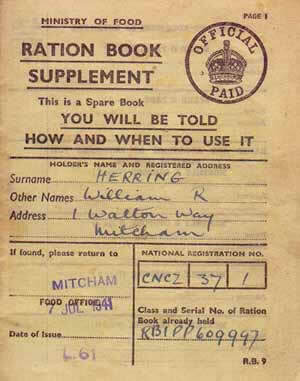 World War 2 rationing started on the 8th January 1940 and lasted quite some time after the war was over. A weekly ration per person would have consisted of:- 6oz of meat, 4oz of butter, lard and cheese, 8oz of sugar and just 2oz of tea and sweets. 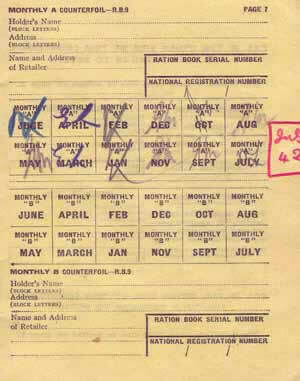 Meat was the last thing to be de-rationed on the 4th July 1954. It's hard for some young people to understand what rationing was like in Britain during the war. You couldn't just buy what you wanted without a ration coupon to cover it. When you had used up all your coupons, that was your lot. Due to this, absolutely nothing was wasted.